If you do systems administration work of any kind, you have to deal with the growing complexity of your environment and increasing demands on your time. 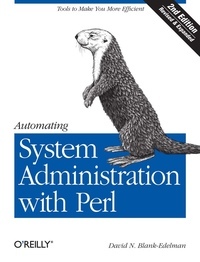 Automating System Administration with Perl, Second Edition, not only offers you the right tools for your job, but also suggests the best way to approach specific problems and to securely automate recurring tasks. This edition includes additional appendixes to get you up to speed on technologies such as XML/XPath, LDAP, SNMP, and SQL. With this book in hand and Perl in your toolbox, you can do more with less — fewer resources, less effort, and far less hassle.